An aerial view of the historic Winterset County Courthouse Square. Updated streetscape elements include decorative street lighting and brick pavement accents. Hanging baskets of flowers add to the aesthetic appeal of the streetscape. Intersection improvements including crosswalks and ada-complaint ramps improve access for multimodal transportation users. This project began as a utility project to replace aging street lighting, traffic signals, electrical services and conduits for a 12 block area. 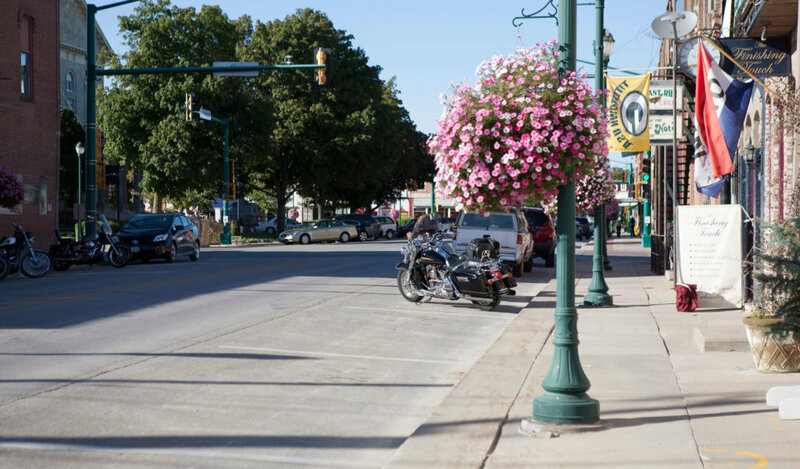 During data collection for storm sewer and water service improvements, Winterset’s City Council and Chamber of Commerce expressed an interest in adding streetscape improvements for beautification. 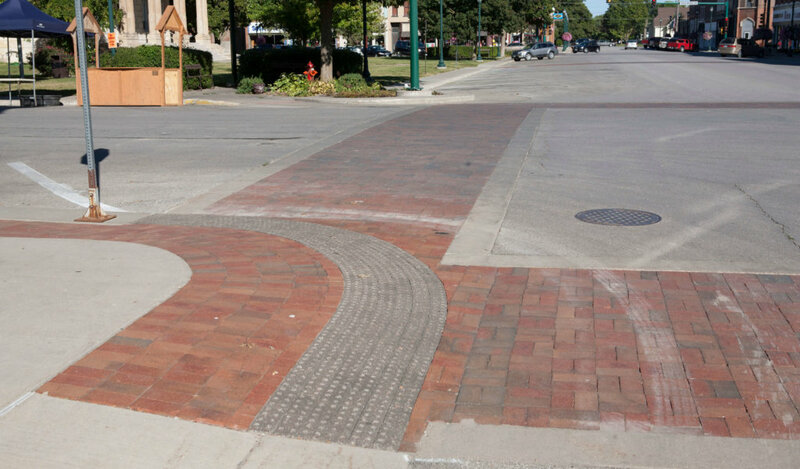 To create a comprehensive streetscape design, the Snyder & Associates’ design team began with a study of existing conditions. During this time, 14 underground vaults and sidewalk openings were investigated, along with ADA accessibility and stormwater management issues. Mismatched light poles, outdated lighting technology, and traffic signals were among the streetscape elements highlighted for improvement. 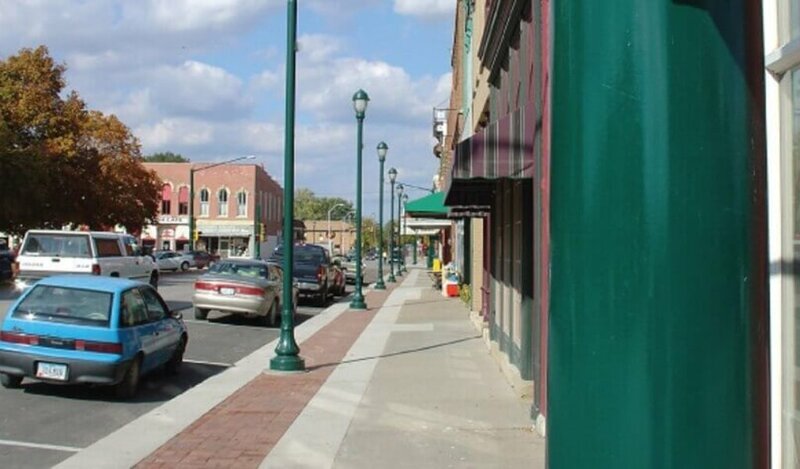 Centered on the historic Winterset County Courthouse Square, the project area includes many restaurants and retail businesses. During public engagement, we discovered that less than a third of these businesses have rear entrances, so maintaining street access became a design and construction requirement. This resulted in an elaborate construction phasing approach that occurred over the span of four years to minimize disruptions to storefront access. Each phase affected only one side of the square, and construction of each phase was completed in one construction season. A cohesive aesthetic appeal and theme inspired by the historical character of the area using decorative street lighting, brick pavement accents, and colorful, annual plantings. Complete street reconstruction including storm sewer upgrades to eliminate ponding and poor drainage after rain events. Mitigation of all vaults through filing or reinforcement to strengthen the structural integrity of the sidewalk. Updated electrical wiring for utilities. Improved traffic and pedestrian safety with new intersection signalization, crosswalks, and a mid-block crossing. Increased multimodal accessibility to area businesses through the installation of ADA compliant ramps. Significant coordination and regular meetings with the city and local business owners to provide progress updates and ensure access needs were met. Civil engineering services provided by our team included streetscape master planning and design, public engagement and meeting facilitation, land survey, and traffic signal systems design. Preliminary and final construction plans, specifications, and cost opinions were also provided.